Johnny Cash’s version of the traditional God’s Gonna Cut You Down, from the album “American V: A Hundred Highways”, was released as a music video on November 9 2006, just over three years after Cash died. Producer Rick Rubin opens the music video, saying, “You know, Johnny always wore black. He wore black because he identified with the poor and the downtrodden…”. What follows is a collection of black and white clips of well known pop artists wearing black, each interacting with the song in their own way. Some use religious imagery. Howard sits in his limo reading from Ezekiel 34, a Biblical passage warning about impending judgment for false shepherd. Bono leaning on a graffiti-filled wall between angel’s wings and a halo, pointing to the words, “Sinners Make The Best Saints. J.C. R.I.P.” A number of artists wear or hold crosses. 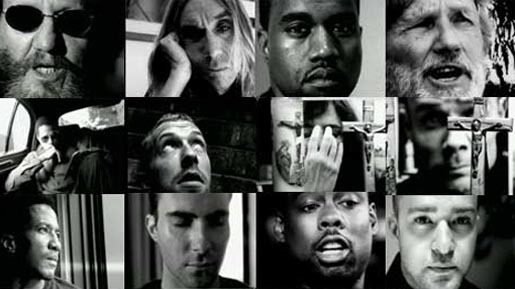 Artists appear in this order: Rick Rubin, Iggy Pop, Kanye West, Chris Martin, Kris Kristofferson, Patti Smith, Terence Howard, Flea (Red Hot Chili Peppers), Q-Tip, Adam Levine (Maroon 5), Chris Rock, Justin Timberlake, Kate Moss, Sir Peter Blake (Sgt Peppers Artist), Sheryl Crow, Denis Hopper, Woody Harrelson, Amy Lee of Evanescence, Tommy Lee, Natalie Maines, Emily Robison, Martie Maguire (Dixie Chicks), Mick Jones, Sharon Stone, Bono, Shelby Lynne, Anthony Kiedis, Travis Barker, Lisa Marie Presley, Kid Rock, Jay Z, Keith Richards, Billy Gibbons, Corinne Bailey Rae, Johnny Depp, Graham Nash, Brian Wilson, Rick Rubin and Owen Wilson. The video finishes with Rick Rubin traveling to a seaside cliff with friend Owen Wilson to throw a bouquet of flowers up in the air. I understand that you are Jewish. If Johnny Cash was here today, I bet he would share something like this below from the scriptures. Johnny was a student of the whole Bible. He wrote the book THE MAN IN WHITE about the apostle Paul and it took him 10 years to write and in that book you can tell that he spent much time in research asking Jewish leaders what life was like for the Jews in the 1st century in Palestine while being occupied by the Romans. What if you could predict that a major world event would take place five minutes from now? What if you could accurately describe what would happen? Would knowing the future give you unusual power? Would anyone believe you? Possibly some would, but how many would not? Many people do not believe the Bible, yet it miraculously foretells hundreds of events, sometimes in minute detail, and usually hundreds – sometimes thousands – of years ahead. Some prophecies concern cities and countries, such as Tyre, Jericho, Samaria, Jerusalem, Palestine, Moab, and Babylon. Others relate to specific individuals. Many have already been fulfilled, but some are still in the future. Jesus Christ is the subject of more than 300 Old Testament prophecies. His birth nearly 2,000 years ago, and events of His life had been foretold by many prophets during a period of 1,500 years. History confirms that even the smallest detail happened just as predicted. It confirms beyond a doubt that Jesus is the true Messiah, the Son of God and Savior of the world. The printed version of this study contains 29 pages of preparatory notes not included in the online version of this study. Click here to order the printed study guide, The Uniqueness of Jesus. And to whom has (B)the arm of the Lord been revealed? he was despised, and (F)we esteemed him not. (H)smitten by God, and afflicted. (J)and with his wounds we are healed. (U)the will of the Lord shall prosper in his hand. (X)and he shall bear their iniquities. (AJ)the God of the whole earth he is called. You and I have something in common and it is the song GOD’S GONNA CUT YOU DOWN. You were in the video and my post about that video entitled, People in the Johnny Cash video “God’s Gonna Cut You Down” is the most popular post I have done in recent years. It ranked #1 for all of 2015 and I have over 1,000,000 hits on my http://www.thedailyhatch.org blog site. The ironic thing is that I never knew what a big deal Johnny Cash was until he had died. I grew up in Memphis with his nephew Paul Garrett and we even went to the same school and church. Paul’s mother was Johnny Cash’s sister Margaret Louise Garrett. Have you ever taken the time to read the words of the song? American singer and civil rights activist Odetta recorded a traditional version of the song. Musician Sean Michel covered the song during his audition on Season 6 of American Idol. Matchbox Twenty also used the song before playing “How Far We’ve Come” on their “Exile in America” tour. The New Jersey rock band The Gaslight Anthem have also covered the song. Canadian rock band Three Days Grace has used the song in the opening of their live shows, as well as the rock band Staind . Bobbie Gentry recorded a version as “Sermon” on her album The Delta Sweete. Guitarist Bill Leverty recorded a version for his third solo project Deep South, a tribute album of traditional songs. Tom Jones recorded an up-tempo version which appears on his 2010 album Praise & Blame. Pow woW recorded a version with the Golden Gate Quartet for their 1992 album Regagner les Plaines and performed a live version with the quartet in 2008. A cover of the song by Blues Saraceno was used for the Season 8 trailer of the TV series Dexter. Pedro Costarecorded a neo-blues version for the Discovery channel TV show Weed Country (2013). Virginia based folk rock band Carbon Leaf covered the song many times during their live shows. SANTIAGO, Chile (BP)–Sean Michel smiled through his distinctive, foot-long beard as he slid the guitar strap over his shoulder and greeted the crowd at El Huevo nightclub with what little Spanish he knows. The former American Idol contestant and his band then erupted into the sounds of Mississippi Delta blues-rock.But unlike other musicians who played that night, the Sean Michel band sang about every person’s need for God and the salvation that comes only through faith in Jesus Christ.”We came down [to Chile] to open doors that other ministries couldn’t,” said Jay Newman, Michel’s manager. “To get in places that only a rock band could — to create a vision for new church-planting movements among the underground, disenfranchised subcultures of Chile.”The Sean Michel band recently traveled through central Chile playing more than 15 shows in bars, churches, schools and parks. The group consists of Southern Baptists Sean Michel, lead singer; Alvin Rapien, lead guitarist; Seth Atchley, bass guitarist; and Tyler Groves, drummer.”Although we’re a blues rock ‘n’ roll band, we’re an extension of the church,” Michel said. “We’re kind of like ‘musicianaries,’ if you will.”MISSIONS-MINDED MUSICIANSThe band formed after Michel and Newman met as students at Ouachita Baptist University in Arkadelphia, Ark. While there, the two began recording and selling Michel’s music as a way to raise money for mission trips to Africa and Asia.”We were just trying to raise money for a mission trip, but we’d also seen God speaking to people through the music,” Michel said. “So we were like, ‘Well, maybe we need to do something with this,’ and we became a music ministry. But it’s always been rooted in missions and … in the Great Commission.”Michel graduated from Ouachita in 2001, Newman in 2004. In 2007, Newman talked Michel into auditioning for American Idol. The exposure Michel received through the television show gained a wider audience for their ministry.”The whole American Idol thing was so weird,” Michel said. “We just kind of went on a whim. But the Lord used it in a big way.”During his tryout, Michel belted out a soulful rendition of Johnny Cash’s “God’s Gonna Cut You Down.” The video of the audition went viral on the Internet. Soon he was doing radio interviews in which he identified himself as a Christian and directed listeners to the band’s Gospel-laden MySpace page. On their next mission trip to Asia, Michel and Newman found that being recognizable gave them access to venues they couldn’t have entered before. The band is now an official extension of First Southern Baptist Church of Bryant, Ark., where the musicians have long been active members serving in the music and youth ministries. Every mission trip they have taken has involved working with International Mission Board (IMB) missionaries. “With short-term mission trips, you can plan, but you just got to be willing for your plans to change,” said Michel. When the band arrived in Chile, they were surprised to find that their schedule wasn’t nearly as full as expected. Almost no public venues had booked shows, and many rock-wary churches had declined to host the band. Disappointed by the lack of interest, the band prayed for God’s help. They met Jose Campos — or Pépe, as the band came to know him. Campos works with music and youth for the Ministry of the Down and Out, an independent Christian ministry that seeks to reach the often-overlooked demographics of Santiago. Campos was able to use his connections to book shows for the band in venues they wouldn’t have known about otherwise. “Had we met Pépe (Campos) two or three weeks before the group came, there’s no telling how many shows we might have done,” said Case, who met Newman at Ouachita when Case and his wife, Cinthy, were missionaries-in-residence there. Campos booked the show at El Huevo, possibly Chile’s most popular club. Playing there has given the band musical credibility among Chilean rockers. And, one Chilean church reported that a youth accepted Christ after hearing Newman talk before a show. The band already is contemplating a return tour next year. Sharing the Gospel through their songs is only the beginning for the Sean Michel band. Their vision is to be a catalyst to help churches — and missionaries — connect with the lost people of their communities. The band wants to see churches take ministry beyond the church doors. The band’s ministry in Chile opened new doors for IMB missionaries to reach the young, musical subculture of Chilean society. Tristan Taylor is an International Mission Board writer living in the Americas. Like you, I have always loved golf and like you I grew up in the Memphis area. 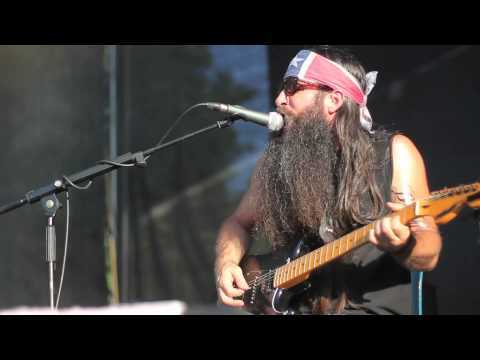 SANTIAGO, Chile (BP)–Sean Michel smiled through his distinctive, foot-long beard as he slid the guitar strap over his shoulder and greeted the crowd at El Huevo nightclub with what little Spanish he knows. The former American Idol contestant and his band then erupted into the sounds of Mississippi Delta blues-rock.But unlike other musicians who played that night, the Sean Michel band sang about every person’s need for God and the salvation that comes only through faith in Jesus Christ.”We came down [to Chile] to open doors that other ministries couldn’t,” said Jay Newman, Michel’s manager. “To get in places that only a rock band could — to create a vision for new church-planting movements among the underground, disenfranchised subcultures of Chile.”The Sean Michel band recently traveled through central Chile playing more than 15 shows in bars, churches, schools and parks. The group consists of Southern Baptists Sean Michel, lead singer; Alvin Rapien, lead guitarist; Seth Atchley, bass guitarist; and Tyler Groves, drummer.”Although we’re a blues rock ‘n’ roll band, we’re an extension of the church,” Michel said. “We’re kind of like ‘musicianaries,’ if you will.”MISSIONS-MINDED MUSICIANSThe band formed after Michel and Newman met as students at Ouachita Baptist University in Arkadelphia, Ark. While there, the two began recording and selling Michel’s music as a way to raise money for mission trips to Africa and Asia.”We were just trying to raise money for a mission trip, but we’d also seen God speaking to people through the music,” Michel said. “So we were like, ‘Well, maybe we need to do something with this,’ and we became a music ministry. But it’s always been rooted in missions and … in the Great Commission.”Michel graduated from Ouachita in 2001, Newman in 2004. In 2007, Newman talked Michel into auditioning for American Idol. The exposure Michel received through the television show gained a wider audience for their ministry. During his tryout, Michel belted out a soulful rendition of Johnny Cash’s “God’s Gonna Cut You Down.” The video of the audition went viral on the Internet. Johnny Cash recorded a version of “God’s Gonna Cut You Down” on American V: A Hundred Highways in 2003, with an arrangement quite different from most known gospel versions of the song. In order of appearance; Iggy Pop, Kanye West, Chris Martin, Kris Kristofferson, Patti Smith, Terrence Howard, Flea, Q-Tip, Adam Levine, Chris Rock, Justin Timberlake, Kate Moss, Sir Peter Blake, Sheryl Crow, Dennis Hopper, Woody Harrelson, Amy Lee, Tommy Lee, the Dixie Chicks, Mick Jones, Sharon Stone, Bono, Shelby Lynne, Anthony Kiedis, Travis Barker, Lisa Marie Presley, Kid Rock, Jay-Z, Keith Richards, Billy Gibbons, Corinne Bailey Rae, Johnny Depp, Graham Nash (holding photos of Johnny Cash), Brian Wilson. It also briefly features archive footage of Cash himself. The video was shot entirely in black and white. Since its release, both the song and video have seen moderate airplay. The video won the 2008 Grammy Award for Best Short Form Music Video. The video was also covered by Rebel Son, Adding a little bit more upbeat sound to the song, Released on the “All my Demons” album. In the 2007 documentary:The Most Hated Family in America. As bumper music for the Alex Jones radio show. In promotional commercials for the hit CW series Supernatural. In the trailer for the 2006 documentary Deliver Us from Evil. As entrance music for UFC fighters Spencer Fisher and Jason Lambert, as well as professional wrestlers Tyson Dux and Brodie Lee. As the entrance song for relief pitcher Joe Beimel of the Pittsburgh Pirates. As the entrance song for Lance Berkman, designated hitter for the Texas Rangers. In a promotional video for the 2008 trial of EastEnders character Max Branning. During the opening sequence and closing credits of David Ridgen‘s documentary Mississippi Cold Case. In the release trailer of the game Splinter Cell: Conviction. In the opening title sequence of the 2010 ITV (UK) series Father and Son. As background music for a series of television commercials for the Jeep Grand Cherokee, including the 2011 “Manifesto” advertisement. In a trailer for the Coen brothers‘s film True Grit. In a 2010 trailer for ESPN‘s 30 for 30 film Pony Excess. In the Being Human episode “Though the Heavens Fall,” as performed by Detroit Social Club. In a dramatic scene of Republic of Doyle (season 2, episode 9). In the closing scenes and credits of “Revelations,” the first season finale of the television show Dallas. In Channel 4’s (UK) trailer for season 2 of the television series Homeland. In promotional commercials for the April 2013 debut of the television series Rectify. In promotional video “We were never born” by a bicycle manufacturer Dosnoventa. SANTIAGO, Chile (BP)–Sean Michel smiled through his distinctive, foot-long beard as he slid the guitar strap over his shoulder and greeted the crowd at El Huevo nightclub with what little Spanish he knows. The former American Idol contestant and his band then erupted into the sounds of Mississippi Delta blues-rock.But unlike other musicians who played that night, the Sean Michel band sang about every person’s need for God and the salvation that comes only through faith in Jesus Christ.”We came down [to Chile] to open doors that other ministries couldn’t,” said Jay Newman, Michel’s manager. “To get in places that only a rock band could — to create a vision for new church-planting movements among the underground, disenfranchised subcultures of Chile.”The Sean Michel band recently traveled through central Chile playing more than 15 shows in bars, churches, schools and parks. The group consists of Southern Baptists Sean Michel, lead singer; Alvin Rapien, lead guitarist; Seth Atchley, bass guitarist; and Tyler Groves, drummer.”Although we’re a blues rock ‘n’ roll band, we’re an extension of the church,” Michel said. “We’re kind of like ‘musicianaries,’ if you will.”MISSIONS-MINDED MUSICIANSThe band formed after Michel and Newman met as students at Ouachita Baptist University in Arkadelphia, Ark. While there, the two began recording and selling Michel’s music as a way to raise money for mission trips to Africa and Asia. Michel graduated from Ouachita in 2001, Newman in 2004. In 2007, Newman talked Michel into auditioning for American Idol. The exposure Michel received through the television show gained a wider audience for their ministry. CLIP ALSO STARS BONO, CHRIS MARTIN, TERRENCE HOWARD, CHRIS ROCK, ADAM LEVINE, AMY LEE, TOMMY LEE. Timberlake then laid out a plan for a video to accompany the spare, moody song, which would feature a series of stars dressed in Cash’s signature black. “And he said, ‘I’m signing up to be the first one,’ ” Rubin said. 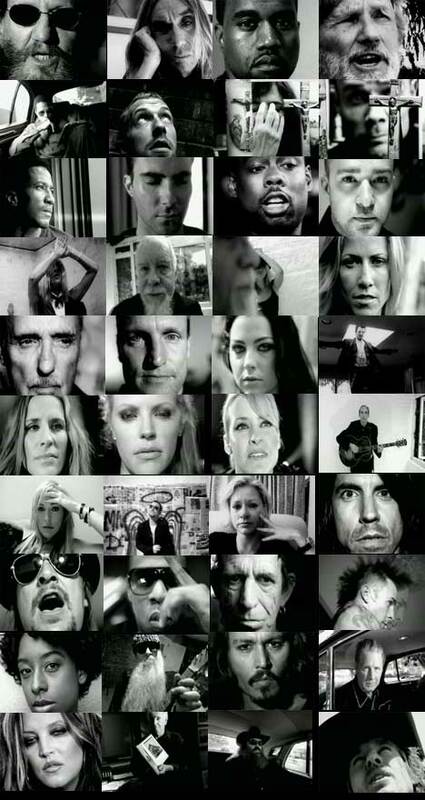 Timberlake tops a list of 36 stars who appear in the clip, including Iggy Pop, Kanye West, Coldplay’s Chris Martin, actor Terrence Howard, Anthony Kiedis and Flea from the Red Hot Chili Peppers, Chris Rock, Maroon 5’s Adam Levine, Kate Moss, Sheryl Crow, Woody Harrelson, Amy Lee of Evanescence, Tommy Lee, the Dixie Chicks, Keith Richards, Bono, (+44)’s Travis Barker, Kid Rock, Jay-Z and Johnny Depp. “I had no idea yet how to market the album, which I’d just finished, since Johnny [Cash, who passed away in 2003] was not there and I wasn’t thinking about doing a video,” Rubin said (see “Johnny Cash Dead At 71”). Inspired by Timberlake’s brainstorm, Rubin called up acclaimed video director Mark Romanek, who helmed the award-winning clip for Cash’s cover of Nine Inch Nails’ “Hurt” (see “Johnny Cash Says Unlike Most Videos, ‘Hurt’ Wasn’t Too Painful”). Though Romanek loved the concept and added some ideas to it, he couldn’t sign on due to scheduling conflicts, so he suggested controversial director Tony Kaye (“American History X”). Kaye, who directed the time-tripping clip for the Chili Peppers’ “Dani California” (which is from an album also produced by Rubin), hasn’t directed many rock videos, but like many of the celebs in the shoot, he’s among the luminaries in Rubin’s thick address book of friends and professional acquaintances. Like the other stars, punk icon Pop is filmed wearing all black. The film’s lightning-fast, blink-and-you-might-miss-it series of quick-edit shots (many of which are close-ups of the stars’ faces) contrast with the slow tempo of the song. The video progresses through a series of quick mini-dramas, most of which were improvised, including Howard in a limo reading a Bible, Rock singing along with the lyrics, Timberlake staring at the camera, Depp standing on a balcony playing guitar, and Bono leaning on a graffiti-filled wall between angel’s wings and a halo while wearing a paper hat. The segments were filmed in Los Angeles, New York, London and (in Richards’ case) Amsterdam. After a slide-show-like recap of all the famous faces, the clip ends with Rubin and actor Owen Wilson sitting somberly in the back of a limousine. We get Iggy and Bono, but what’s Wilson’s connection to the whole thing? “It just made sense that if I was honoring Johnny, I’d have a friend there with me,” Rubin said. He also said Kaye has directed a clip for the Cash tune “Help Me” that is not celebrity-driven, but is equally gripping and slated for release in the coming months.